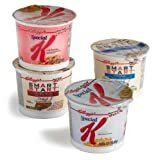 Like the writers of many other reviews I read, I got a disproportionately high amount of plain Special K - around 30 of my 60 bowls. I got no bowls of the Kashi cereal. The net weight of a bowl of plain Special K is 1.5 oz, whereas the other cereals weigh in at around 2.5 oz. 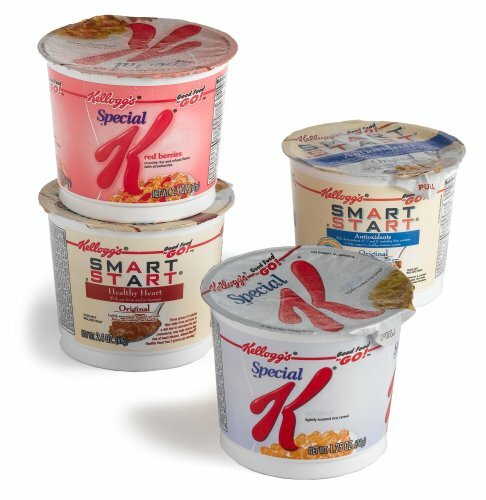 Special K is also the cheapest cereal to make of the four, making it extremely suspicious that many shipments of this "assortment" seem to be unbalanced in its favor. I'm a big guy. One of these just doesn't cut it for breakfast. But they make great snacks throughout the day. The packaging makes it very convenient to keep a bunch in my credenza at work. Sometimes I reuse the bowls to make hot oatmeal. Just remember they're not microwave safe. Don't ask me how I know! They just aren't okay?! There is NO KASHI at all!!! The various cereals included in this 60-pack box are health-promoting and very convenient. Each cup (more like a medium-sized bowl, really) contains about 2.5 oz net weight of cereals. Some have more calories than others, but all are quite tasty. I eat these with skim milk so I hope my cholesterol level can come down soon. This is an attractive item; however, I am disappointed that the Start Smart has partially hydrogenated oil in it, and therefore will have to forego this nice convience product. First off, I love the fact that I can take them to work and just add milk. I also like this variety better because it doesn't have a bunch of sugar cereals in it. The only catch is the assortment isn't anywhere near what it is supposed to be and I only got 57. I haven't found any other place to find this product. All the stores have less variety and smaller sizes. Did anyone else find anything better then this? Unless you've never had cereal, you know what to expect! The product is a bit expensive, however, for the convinience it's worth it. Never need to get a creal bowl again, good portion for guys / grown ups. It's a bit too much for my wife to finish in 1 shot, it's actually perfectly fine for 2 breakfeasts, so it works out. Luckily I have 2 nephews, so 1 cup is perfect portion for them as well. Personally, I like the convinience of pouring milk right in it, no need a bowl. Good for someone who eats breakfeast at work. Deducted a 1/2 star because it could have been a bit more variety, on my 2nd case now, getting a bit bored of the taste. Deducted another 1/2 star because the cups really could have been made of paper instead of plastic for environment sake. I try to find uses for the plastic cups, but after 1 case of these, there's really nothing more I can use the cups for. Silly me - I thought 60 containers meant 15 of each of the four types of cereal. Instead, I got 22 of the plain Special K (my least favorite of the four) and only 4 of the Kashi (the one I really wanted). I'll eat them because I paid for them and they are convenient but I won't buy this "assortment" again. I eat these cereals everyday, and I would buy the box, the put in bowl everyday to take to work. With my hours most peoples lunch is my breakfast. The cafeteria where I work sell these at 1.99 a pop, which is even more costly than buying the box. I bought these when they were running on the extra specials and it is great, I just pop one in my lunch bag, buy either milk or yogurt at work and i have breakfast. Because of the sale, the price was right, the product is awesome. Trans Fats and "Wellness" really don't go together!